A week hasn't even passed since the 2012 election and already a new poll has announced Hillary Clinton as the runaway leader among 2016 favorites. For her part, the well-traveled Secretary of State said she just wants a chance to "sleep and exercise and travel for fun" once she steps down from office. And watch some serious television, including her favorite shows about home improvement. "I find it very calming," she told the New York Times in an interview published over the weekend. Clinton's favorite show? "Love It or List It," which airs on HGTV and follows a new couple each episode trying to decide whether to redesign their current home — or just buy a new one. "Maybe I'll get a decorating show," Clinton quipped when asked, again, about her plans once she steps down from office. In all seriousness, she said she first wants to find time for herself and relax. "It sounds so ordinary, but I haven't done it for 20 years. I would like to see whether I can get untired," she said. According to a new poll, she only has a few years before the nation will ask her to step back into the political spotlight. 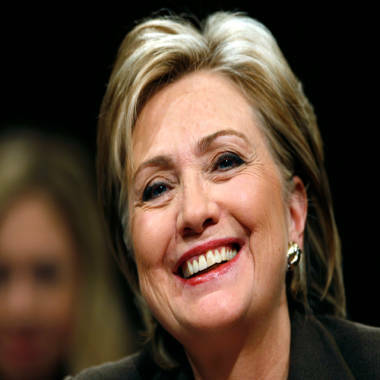 The survey by Public Policy Polling found Clinton the favorite candidate among Democrats polled in Iowa and New Hampshire, the first two states on the political contest calendar. Clinton had support from 58 percent of Iowa Democrats asked about the 2016 election, compared to the 17 percent who favored runner-up Joe Biden. She had 60 percent among the Democrats in New Hampshire, while the vice president only had 10 percent. The surveys were taken Nov. 3-4, while many voters were still being asked about the ballots they would be casting this year. However, they show how Clinton's popularity has risen since she ran for president in 2008, when she lost the party's nomination to Barack Obama. Since then, the former first lady and U.S. senator has beefed up her resume by learning about, and actually meeting with, nearly every foreign head of state in the world. But first, she told the Times she looks forward to next year, when she can do everyday things like exercise. "I work out and stuff, but I don't do it enough and I don't do it hard enough because I can't expend that much energy on it," she said.